The latest exhibition at the Leubsdorf Gallery at Hunter College has great potential to open up medieval reliquaries to a larger contemporary audience, if they have the patience to read a little. Accompanying a loan of five medieval reliquaries from the Metropolitan Museum of Art are modern and contemporary works by Joseph Beuys, Olafur Eliasson, and Hannah Wilke, among others. The exhibition was born out of a graduate class taught by medievalist Cynthia Hahn, who asked her students to identify artists who worked with similar ideas or materials to those found in the medieval reliquaries. The curators organized the show around five overlapping themes spread across the three open rooms of the gallery: vision/senses, body/death, fragment/composite, photograph/index, and time/memory/ritual. The themes highlight general ideas found in both the modern and medieval works, and provide a context in which a few works can relate to one another. The collection of daguerreotypes by Charles Schwartz presents an interesting 19th century link between the medieval and the contemporary: though they lack religious context, they are still firstly objects of remembrance, rather than objects of art. 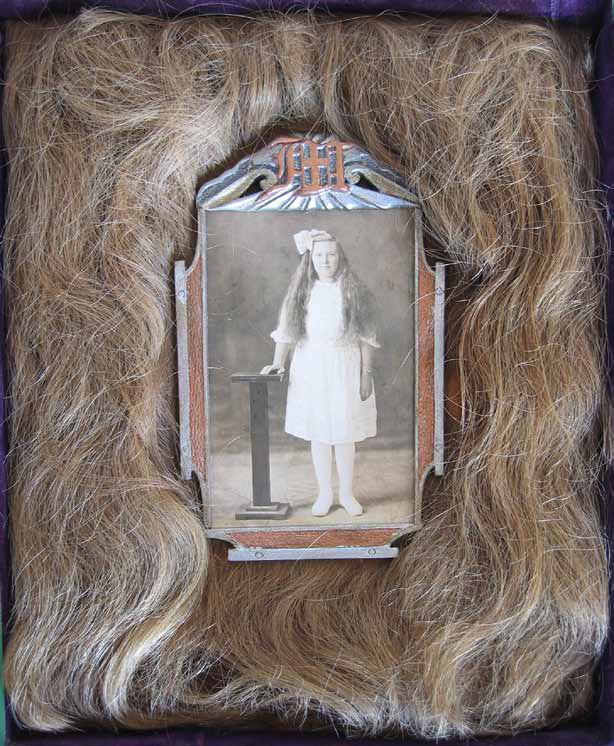 The ethereal Photograph of Mary H. Helgeson Surrounded by Her Actual Hair at first appears to be a tragic memento of the loss of a young girl, but happily, this relic preserves a memory of an important haircut, from the long waves of childhood to a woman’s bob. It is a piercing reminder that not all relics must stand for death. In medieval times, relics honored and preserved the holy after their death, serving as an intermediary between this world and the next. Relics often performed miracles of healing, emphasizing their otherworldly presence. As religion lost importance in the construction of modern relics, their function became more about remembrance than divine intervention. There was no fear that without a relic, a saint’s life would be forgotten, but these daguerreotypes illustrate the growing desire to commit to memory people, places and events. Photograph of Mary H. Helgeson Surrounded by Her Actual Hair. 1930. Photograph in wood frame and hair. 11 ½ x 16 in. Bryan Zanisnik’s dual-monitor video work Preserve (2009) intersperses clips of his father leading tours of his New Jersey home and a taxidermy museum in Maine. Often hilarious, his father relates tales of skunks caught at Gracie Mansion and of a small bird gifted by Teddy Roosevelt. The obscured meanings of relics require explanation. Without them, they would be nothing more than fragments of wood, cloth, or bone. It is the words that provide context to the faithful, and imbue the object with divinity. In this way, Zanisnik’s father recontextualizes average household junk, placing it in a historical lineage that accords it some prestige. Zanisnik’s video recalls another idea threaded throughout the exhibition: the question of authenticity vs. artifice. Zanisnik’s father’s stories could be true, but are most likely not, and so the viewer must decide whether to make the leap of faith with him. Two other contemporary pieces in the show force the viewer to grapple with their perceptions of reality. Eva and Franco Mattes’ series Stolen Pieces (1995-1997) consists of a small chunk of metal, supposedly taken from a work by Joseph Beuys, along with a video documenting the pair stalking museum corridors until they find the perfect hit: a painting by Alberto Burri, from which we see Franco apparently abscond with a shred of its burned fabric. Stolen Pieces is displayed near an intact Beuys piece, Sled (1969), a sculptural document of Beuys’ biographical mythology. After his plane crashed in World War II, Beuys was found by a group of Tartars who wrapped his body in fat and felt, strapped him to a sled and pulled him to safety. The sled on display here reads almost as a Beuys survival kit, with all the necessary ingredients for a successful rescue mission. Both the Beuys and the Matteses works are almost certainly fictional. However, the wavering moment of hesitation cannot be totally shaken. We are pushed to believe by the relic-like qualities of the works, their emphasis on documentation and remembrance of a physical link to the past. Lacking the religious imperative to believe, the contemporary pieces are left with a clever playfulness. This lies in contrast to the medieval works. No matter how great the implausibility of the relic in medieval times, doubting its veracity would be an admission equivalent to doubting your faith. There was no truth to be gained through doubt. When exhibited amidst the seriousness of the medieval relics, the contrast between the works’ message may be overly simplified. Despite the inherent sense of humor of Stolen Pieces or Preserve, these artists are also creating their own solemn artifacts of the past. And perhaps the medieval relics lose some sanctity when nearby works envelop the viewer in doubt. It was not a concern that these objects be perceived as real, but in a contemporary gallery it is impossible not to consider that they are fake. 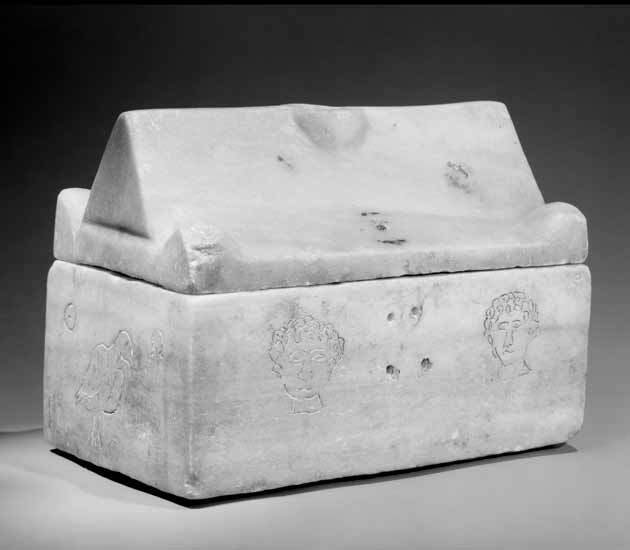 Two works that assert their truth through sensory interaction with the viewer are the Byzantine reliquary casket (6th c.) and Gayil Nalls’ World Sensorium (1999-2000). Small holes on the lid and side of the casket are remnants of a lock that kept the relic both secure and totally hidden from view. The only method of interaction with the precious relic was an opening at the top of the reliquary, where strongly scented offerings of oils could be poured into the container. While the casket is now empty, the porous marble retains an olfactory relic of its own, a lingering vestige of devotion. A contemporary parallel to the Byzantine casket, World Sensorium is also activated through our sense of smell. Nalls creates a perfume from the national plants of 230 countries and proportions the scents according to their country’s population in 1900. Ask for your own sample of the perfume from the desk—a whiff of the fresh smelling fragrance is disarmingly complex, making it impossible to discern the individual notes. While Nalls attempts to capture the scent of a past and bring it to the present, scent works in a very different way in the Byzantine casket. Devotees honored the relic of the past with the most luxurious goods of the present in the hope that they would be rewarded with protection and healing. Most of the other objects in the exhibition rely on non-olfactory interaction, like the French arm reliquary (15th c.). One would normally assume that an arm reliquary such as this would contain some fragment of saintly ulna or radius. Surprisingly, however, Hahn makes clear in the catalog essay that this arm of St. Fiacre, and probably most body reliquaries like it, do not. Rather, the bodily shape of the reliquary has more to do with the symbolic use of the object—in this case, as a literal arm reaching out from the clergy to the believers, with, as its worn fingers attest, a healing touch. One of the stand-out works of the show, Venus (2010) by Melissa Hacker, specially commissioned for the exhibition, is displayed perfectly at the end of a small corridor, the peephole shaped projection enhancing the feeling that you are spying in Venus’ bedchamber. The camera floats past her fingers, clutching her satin sheets, up to her pearl necklace and cascading blonde locks which frame her face, her mouth slightly open in ecstasy. But in place of Venus’s heaving breast is an open cavity, with organs neatly arranged, because Venus is, in reality, a wax anatomical model resting at the Josephinum Medical Museum of Vienna. Despite its similarities in form to a relic, its religious function as an object of veneration has been replaced with a scientific function as an object of study. Like the arm of St. Fiacre, the form of the body is directly related to its function, here, cut open as a didactic tool. Venus, 2010. Single-channel HD video. 4 minutes, 13 seconds. Hannah Wilke’s Intra-Venus Triptych (1992-1993) attempts to address the same issues of death and sexuality as Hacker’s Venus, but falls short of the mark. This documentary work contrasting Wilke’s treatment for lymphoma with her sensuous poses is the most abject of any of the works on display here. Wilke appears sprawled over rumpled white sheets reminiscent of coffins or hotel rooms. Her bandaged hips and swollen body disrupt the femininity of the poses. It works more as a memento mori: what you are I once was, what I am you will become. But can one “relic” oneself? A reliquary inherently suggests devotional importance to others, rather than a desire for remembrance. It is easy to link the reliquaries to their contemporary counterparts through the grotesque and the body. These sensory comparisons are immediate and universal, perhaps the best method of drawing in art historians who are too quick to dismiss medieval work for being distant and boring. Without background knowledge, one can see how a silver, gem-studded arm would be imperceptibly different to another silver, gem-studded arm. The devotional function of the object, the relic it contains, and the centuries of additions and modifications made by the faithful are all essential to understanding the piece. At the Leubsdorf, using QR Codes and your smart phone, the catalog entry for each work is immediately brought up, making it very easy to access this background information. The catalog rightly references Paul Thek’s Technological Reliquaries, from the recent retrospective at the Whitney Museum of Art, an immediate companion to works like the small reliquary cross with an image of Christ crucified on the outside and ostensibly some sliver of wood from the True Cross held within. The image of Christ’s suffering on the cross is right in line with the bloody, oozing chunks of flesh and fat contained in Thek’s sculptures. But, compelling as such comparisons may be, there are less obvious relationships between the medieval and the modern that the curators have drawn out. Some sense of historicity is inherently lost by pairing the medieval with the modern and emphasizing only the qualities in each that are reflected in one another. But, hopefully, shows like this can be seen as a starting point for two divergent crowds to meet each other and expand their knowledge. While we may be pushed past our point of comfort in making connections spanning so many centuries, it is essential that we continue to inform our own art historical interests with appropriate material from the greater story of art.